We manufacture semi Synthetic Iron oxide red (red oxide) of 96-99 % purity and in mean particle size of 3-11 microns.It is heat-stable and provides better anti-corrosive properties. It is an ideal substitute for natural red iron oxide, as it has double the strength leading to saving in costs of transportation, storage, loading. Our product iron oxide red is very much in demand in India as well as in overseas market. We have taken large steps to get ourselves listed amongst the largest synthetic iron oxide red manufacturers in India. Our iron oxide red is presently used in Paving Blocks, Pavers, Abrasive Grinding Wheels, Float glass, Ferrite Magnets and Ceramic Insulators etc. 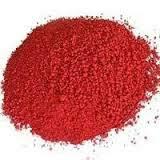 We offer red iron oxide to our customers at very low price.